The Beginning of the End for Bilic? Whatever happens in the coming weeks is must be a question of when rather than if Slaven Bilic leaves West Ham this year? Unless our run of 5 defeats on the run is matched by an equal and equivalent run of victories leading to a top half finish it is very difficult to imagine a scenario where Slaven Bilic is still the manager of West Ham at the start of next season. The immediate question is whether results will be good enough for him to make it to the end of the season. I believe that a manager’s credentials are often found out in a second season where initial success built on previous foundations becomes several steps backwards once a team reflects entirely the manager’s image. We don’t need to look much further afield than Roeder and Zola for examples of this; now Slaven Bilic is failing this test. Extra time to get it right could be justified if there was a sense of a work in progress creating something for the future but I fear the opposite is true and currently all we have is a short term vision only (though this is not solely the fault of the manager). On the evidence of this season Bilic falls short in many areas including player recruitment, team selection decisions, tactics and fitness levels. It is interesting that despite the abysmal form and performances for the best part of the season that Bilic continues to ‘enjoy’ a significant level of support from sections of the West Ham fan base, predicated largely on his passion and the fact that he, at least for a while, pulled on the famous claret and blue jersey. Bilic supporters will point an accusing figure at the Owners and/ or the Stadium as the major factors influencing the season’s failures. I have tried to understand these arguments (not that both might not have their faults) but it is difficult to link them directly with poor on-field performances. 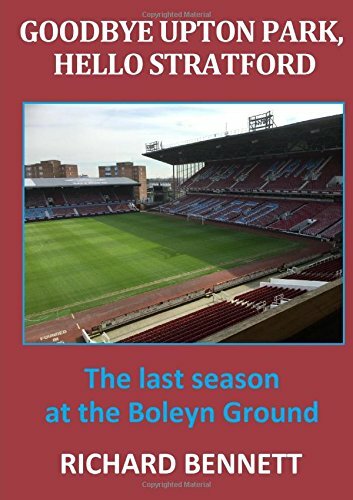 Bilic often cites the struggles that other clubs have when moving to a new stadium and frequently mentions Arsenal’s move from Highbury as an example. Yet if you look at Arsenal’s first season at The Emirates (where we became the first away side to win in April of that season) you will see that their record was only marginally impaired picking up 6 points fewer (and one less defeat) than the final year at Highbury (45 points down to 39). I am willing to accept that getting familiar with a new stadium can affect the dynamic of home advantage but it is a stretch to suggest that it is responsible for everything we have seen home and away from West Ham in 2016/17. Owners are always an easy target when things are not going well and everyone has their own opinion on maintaining tradition versus the commercial reality of the modern game. Part of that reality is that these people own the club and are not simply an easy to replace board of directors. Their responsibility aside from commercial operations is to appoint the right manager and provide him (or her?) with adequate financial backing for transfers and salaries. Like most I do not know how transfers and player recruitment work at West Ham, although that does not stop plenty of people from making stuff up in order to suit their argument. In an ideal world there would be a scouting network that identifies candidates with particular attributes that can fill a specific role within the style of football played by the club. The manager would select his preferences (or maybe add his own names to the list) and the owners would try to put together a viable deal acceptable to all parties. There is little evidence that it is as structured as this at West Ham with transfers carried out in a chaotic, inconsistent, scatter-gun manner. Such disorderly dealings are more likely to be the recruitment problem than the popular ‘two-bob’, ‘penny-pinching’ jibes thrown around by fans. For a club of our size we have invested heavily in players but predominantly with a short-term view that has resulted in few sale-able assets; so we rank high in net spend but relatively low in gross spend. I am not aware of many proposed transfers that have fallen down because the manager was not backed by the owners. On the other hand I feel we waste a lot of time publicly chasing unrealistic big-money targets who are never likely to sign for a middle ranking Premier League club. A bolder and more sophisticated player recruitment policy is needed that focuses on younger talent who will fit into a particular style of playing. If an occasional experienced player is required then that is fine but regularly bringing in players touching 30 and above should not be the norm for a forward thinking club. Failing that late season miracle it must be a case of when rather than if Bilic leaves the club. Deep down Bilic must know that and has only his pride to motivate him. In my opinion we need to hit the 40 point mark before the end of April and a large part of that is winning on Saturday. What happens if we don’t is problematical. There is no credible number two waiting in the wings and time is too short for a permanent new appointment. Is there a short-term troubleshooter out there anywhere?